I was born in Mexico City in the 1960s. I caught polio when I was eighteen months old. I was unable to walk without crutches. I was lucky to live near a polio hospital. It was directed by a nun who made a huge difference in my life. She gave my mom great advice: “If your daughter falls down, pretend you don’t see. Let her figure out how to get up.” My mom said it was extremely painful for her to do that. But it made me learn how to get up on my own. My disability could have been the most tragic thing in my life. But I used it as fuel to grow strong. I learned to thrive despite many obstacles. The first time I visited the United States, I saw a bus with a lift for disabled people. It made boarding so easy! I was determined to bring accessible buses to Mexico as well. I worked in the San Luis mayor’s office, and I launched the city’s first buses with lifts. It changed the lives of people who’d been unable to move around the city before. I saw then that I had the power to transform my community. I successfully advocated for city funds to pay for hearing aids for a little girl who couldn’t afford them. Then I launched a collaboration between government, foundations, and service clubs to donate hearing aids to hundreds of children. After that, kids in the street would stop and show me their hearing aids. I also organized initiatives to bring wheelchairs to San Luis residents. I learned firsthand that wheelchairs are life-changing. I sat in one for the first time on my second trip to the U.S. I played basketball—and I could move so fast. My shoulders hurt less. I had assumed that using a wheelchair would be depressing. In a way, it was liberating. 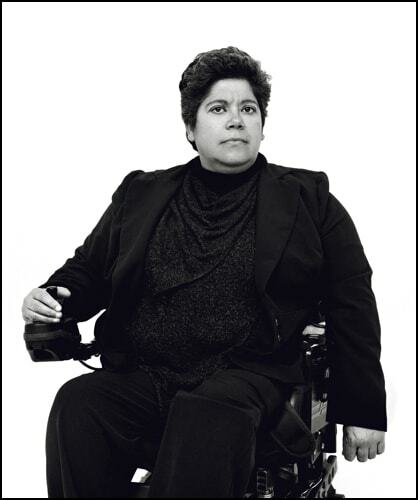 In 2001, I moved to the U.S. and became the director of a nonprofit working with wheelchair users around the world. I’m now the executive director of the Spanish Speaking Citizens&apos; Foundation. My experiences as a female immigrant and polio survivor have made me a person who looks for creative solutions. Now, I get to think creatively about the challenges facing Spanish-speaking Latinos. I truly love my work. It’s amazing to see the difference I can make in someone’s life. Alicia Contreras is currently the executive director of the East Bay Spanish Speaking Citizens’ Foundation (SSCF) in Oakland, California. Before 2015, she was executive director of Women Pushing Forward (Formerly Whirlwind Women). Alicia is a wheelchair rider and a citizen of Mexico. In the U.S., while a New Voices Fellow, she received the Paul Hearne Award. In San Luis Potosí (SLP), she negotiated the first city funding for disabled people and founded the first independent living center for women in Mexico. In 1995, she served as a Mexican delegate to the United Nations/NGO Forum in Beijing.